Description: Learn about the historical periods of Ayurveda, the foundational texts and their authors, and prominent schools of thought. 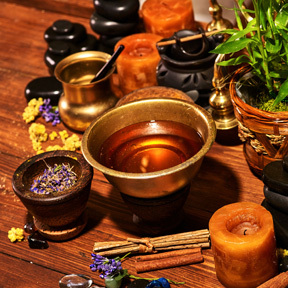 Starting with an overview of the origins and development of Ayurveda from the Vedic period to modern time, we will discuss the Samkhya philosophy of life science. We will apply special focus on the principle of the individual constitution – the three doshas. According to Ayurvedic philosophy, the three doshas are the energetic principles that govern our physical, psychological and emotional wellbeing. Class discussions will also address the Ayurvedic principle of living in harmony with nature and the environment. Supplemental text: Ayurveda Science of Self Healing by Vasant Lad which is available for purchase at Bastyr's bookstore. Dr. Shanbhag is a naturopathic doctor, ayurvedic expert, professor and best-selling author. He is the founder and director of the Natural Medicine Clinic, Academy & Wellness Spa which has two clinics in the San Francisco Bay Area. Dr. Shanbhag specializes in integrating Ayurveda, naturopathic medicine and yoga to treat acute and chronic diseases. For more than 30 years, he has successfully run various Ayurveda institutions in India and the U.S. He was founder and director for 17 years of AYU Academy & Clinic, Seattle. In 2006 he sold this successful institution to Kerala Ayurveda. During 1991-96, he was chairman of the Ayurveda Department of Bastyr University. During 1985-88 he was head of the Ayurvedic Research Institute, Pune. Dr. Shanbhag is currently on the faculty of Bastyr University, MMI Ayurveda College, Kerala Ayurveda Academy and Vedika Global. He is the best-seller author of Beginner’s Intro to Ayurveda by Keats Publishing. In 1988 he was awarded the prestigious I.I.M. Gold Medal for his MD-Ayurveda research thesis. In 2010 and again in 2013, he won International Awards for Excellence in Ayurvedic Teaching and Practice. He has also been a sought-after keynote speaker at national and international conferences in the fields of Ayurveda, naturopathic medicine, yoga, wellness and nutrition.